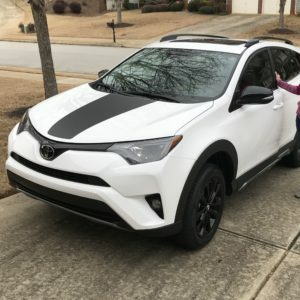 My husband & I purchased our RAV4 2018 Adventure in December 2017. The SUV includes all-wheel drive (AWD) and a safety package. This SUV does NOT include navigation, though I so wish it did!!! We bought this from the Auto Nation Toyota at the Mall of Georgia Dealership. We financed the vehicle to obtain a lower price, but we paid off in the first 60 days. We also purchased the extended warranty, which I feel was a mistake. Our son, who was 11 months old at the time, was with us when we bought the car, and it was very difficult to think through the details of the purchase with his sweet distractions. The extended warranty cost approximately $3,000. The total on the Toyota sticker was $31,094, but this dealership added its there own sticker to that price. The total with the dealership sticker was $32,990. As a part of the purchase, I paid $500 for a cargo cover and the $3,000 for the extended warranty, bringing the total to $36,281. Over Memorial Day weekend, my parents bought a 2018 RAV4 XLE. This one has the safety package and navigation. This SUV does NOT have AWD. My parents had been searching for awhile for a new RAV4, and had been in contact with a sales person for awhile at the dealership. Amazingly, Marietta Toyota offered $8,000 off the sticker price during their fantastic Memorial Day sale! Their dealership does not add its own sticker to the Toyota sticker on vehicles. My parents paid a total of $24,150 for the vehicle. The Memorial Day sale at Marietta Toyota dealership continued for a couple days after the weekend. Because my parents secured such a wonderful deal, my sister & brother-in-law headed to the dealership to look at its inventory, as they were also in the market for a new vehicle. They ended up purchasing the 2018 RAV4 Adventure, with the safety package. They were also able to receive $8,000 off the sticker price thanks to the special holiday sale, and paid a total of $25,370. The reasons why I think my RAV4 ended up costing more than my sister’s and parents’ vehicles. For starters, I bought my car earlier in the year, when the 2018 vehicles had recently been released. In additional, the dealership that I bought my car from had what seemed like extras to the Toyota sticker price. Also, I didn’t buy the care during incredible sale that offered $8,000 off the sticker price. Finally, I think that getting was a decision that we would not make if we were buying the vehicle now. But, I’m incredibly happy with my vehicle!